The pictures we take with our iPhones are not always perfect because they contain unwanted objects in the background. Furthermore, removing a background of a photo will allow you to superimpose it over a new picture you choose, which means that you can design your own perfect picture. But changing the background of a photo goes beyond just improving the quality of your iPhone photos because you can also use this powerful technique to produce amazing photo collages that allow you to express your creativity. In this article, we are going to present to you five most powerful background changer apps that will enable you to create amazing images that captivate the viewer's attention. Each entry on this list can be downloaded for free at the app store, but all of the entries also contain in-app purchases. Even though this background changer app for iPhone doesn't provide many options, each feature it offers is powerful enough to allow you to remove any part your photo. For example, the Target Auto Area Remove tool erases the parts of a picture that have a similar color, which makes this app extremely fast and efficient if you are trying to remove a monochrome background. The app lets you add a new background photo to the image on which you removed the background and you can also select the size of the output picture. Users of this iOS app can choose whether they want to save images they edit as JPEG or PNG files. Pic Editor provides advanced background removal tools that allow a great level of precision, while options such as Target Area or Target Color can be used to speed up the background removal process. If you don't feel confident removing a background or if at any point you make a mistake you can use the Restore/Reverse tools or Undo and Redo features. Despite the fact that this background photo remover app doesn't offer much photo editing options, it is still capable of efficiently removing the background of any photo. Over one hundred background templates and powerful Cut, Copy and Erase tools which are unbelievably easy to use make this photo background changer app one of the best of its kind. 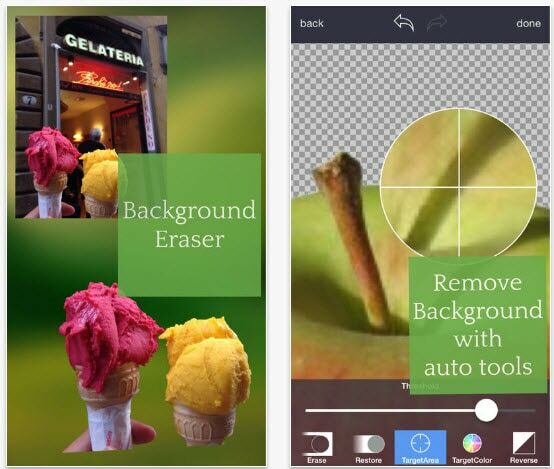 Each foreground photo you create with Pic Background Eraser can be saved in the Foreground Gallery. The app provides more than 25 different blending modes which guarantee that each photo you create will look like an artwork. The huge selection of stickers and more than 70 different font styles can be used to create entertaining images your friends on social media are going to love. This photo background remover app allows you to have fun with your photos because it provides powerful tools that even a child can use. The app lets you zoom in to the pixel level, which allows you to have more precision while you are removing the background of the photo. The Magic Wand tool removes the same color areas of a photo automatically, and the app offers a wide range of brushes that goes from very soft to hard. Magic Eraser allows you to save high-resolution images without a watermark in PNG or JPEG file formats. 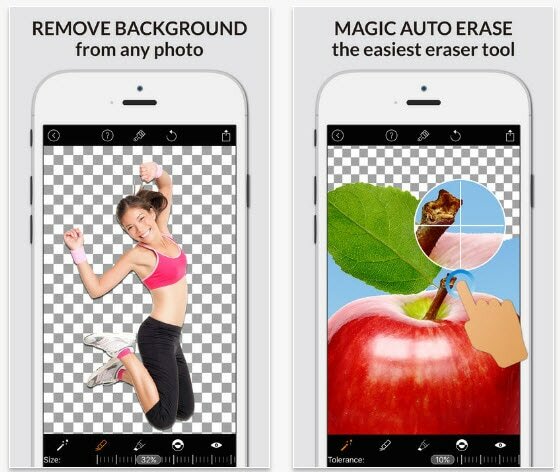 This app does exactly what its name suggests, it enables its users to precisely cut any part of a photo and paste it into a new background. 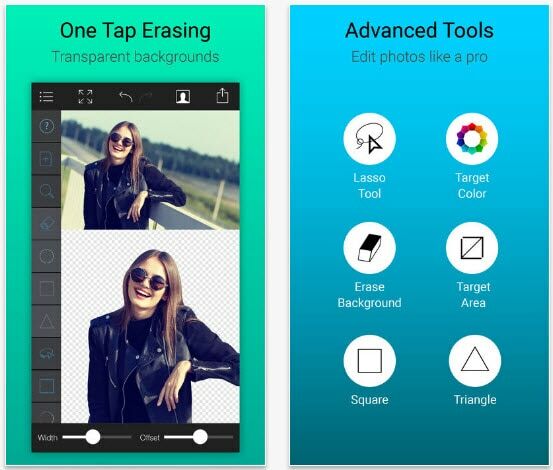 The photo background remover app lets you erase the background of an image and it provides over a hundred HD background templates. Users of this iOS app can also add multiple foregrounds to a photo, while 25 blend options guarantee that the final picture is going to look realistic. Stickers, filter or text options are also available to all users who want to create images for social media. Removing a background from a photo is a fun process that should allow you to express your creativity and explore endless ways in which you can combine foreground and background images. 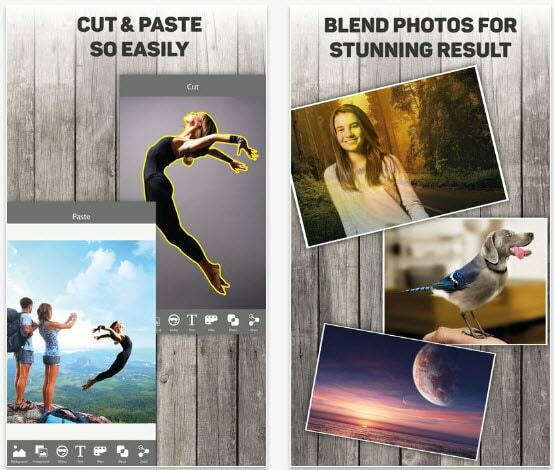 The apps we featured on our list will undoubtedly provide all the tools you need to create pictures you will be proud to share with your friends. 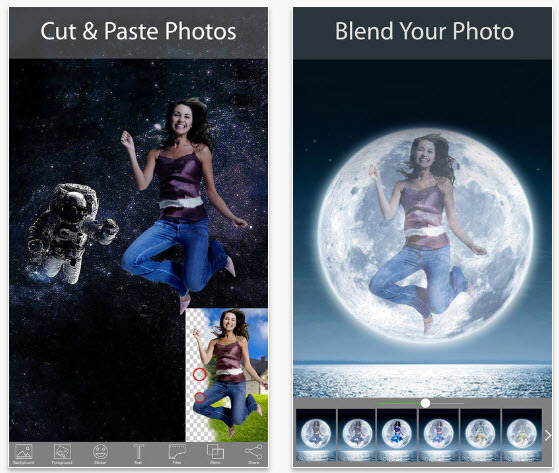 We would love to hear which photo background remover app you like to use the most, so leave a comment and let us know.